Check the weather before leaving home and especially before travelling an extended distance. Give yourself extra time to get to your destination and do not rush. 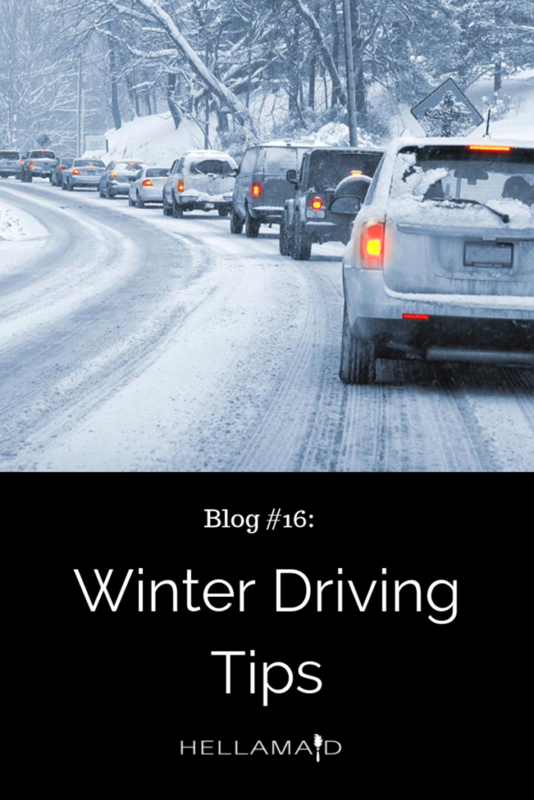 Make sure your vehicle is prepared with winter tires, great brakes, antifreeze fluid, and well-working car battery. Have supplies in the vehicle such as jumper cables, ice scraper, and blanket. Clear snow/ice from windows and mirrors and from the top of vehicle. Leave plenty of room between vehicles especially during times of low visibility. Have an emergency contact plan that includes vehicle assistance. Hellamaid Cleaning would like to take this opportunity to remind our valued clients that the safety of our cleaners is of the utmost importance to us so we have advised them to take extra care during the winter season. This may cause some delays in reaching a booked service or slight scheduling changes, however, with good preparation and the exercise of caution, we hope these are as minimal as possible and our services can continue as great as ever! Hellamaid Cleaning wants you to get through winter driving like a champ!